May is always a month full of the promise of new life at the Farmers’ market, as, now we are into longer days, we start to see the first signs of the bounty of produce that will be arriving for the summer. It should be the month for one of the country’s not-to-be-missed seasonal treats – wonderful English asparagus, (which I buy at my local market, Penshurst, from Michael Bourne of New Park Farm) . But this spring, after the cold of the long winter, the season is several weeks behind, and growers are still waiting to start their picking. If you do find the first early spears available, buy them – the season is likely to be short but hopefully sweet! Asparagus is at its sublime best when picked and cooked within hours before the natural sugars start to turn to starch, something easily achievable when bought locally at the market when it may well have been harvested that very morning, unlike the supermarket versions which may be days old and have lost both the distinctive sweetness and tender texture as a result. Make the most of the pure flavour by serving simply steamed with melted butter, or toss with crumbled local goat’s cheese and a simple vinaigrette. If you do find some early spears try them in the risotto recipe below with the perfect pairing of scallops – the window for both at the same time is a short one. Other spring vegetables are just starting to appear after the cold of the winter. Look out for are tender little early English new potatoes giving the Jerseys a run for their money. Summer leaves such as spinach, watercress and early lettuces can be found sitting alongside the last of this year’s main vegetable crop of purple sprouting broccoli, spring cabbage, cauliflower, spring greens, spring onions and radishes. The wealth of summer berries are still ahead of us but do make the most of green outdoor grown rhubarb this month in crumbles, pies and fools. Or try making your own rhubarb jams and chutneys – the sour sweet flavour of the fruit is ideal used this way, particularly if you add ginger as a flavouring. Wild sea trout is one of the season’s great treats – smaller fish make a lovely meal for one. Lemon sole, plaice, cod, halibut and sea bass are all good at this time of year, and shellfish fans should keep an eye out for razor clams and cockles. For meat eaters spring lamb should start to appear during the month and is not to be missed especially here in Sussex and Kent where the salt marsh grazing gives a particularly fine flavour (see the story on Kent lamb at Saffron Magazine). Locally reared beef and pork will be at its most succulent as the grazing starts to green up. 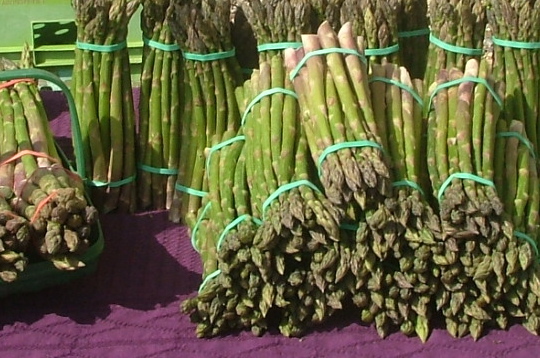 Cook the asparagus in a large shallow pan of simmering water for 4 – 5 minutes until just tender. Drain, reserving the cooking water. Run the asparagus under cold water to stop it cooking any further. Pat dry and cut off the asparagus tips and set aside. Slice the stalks into small pieces. Make the cooking liquid up to 1.2 litres (2 pints) with stock and keep simmering in a pan. Melt half the butter and tablespoon of oil in a heavy based pan and add the chopped spring onions. Cook for a few minutes until soft then add the rice. Mix to coat the rice in the butter and cook for a further minute or two. Add the hot cooking liquid a ladleful at a time, stirring until each amount is absorbed by the rice keeping the mixture creamy. Keep adding stock and stirring for 15 – 20 minutes until the rice is just tender – ‘al dente’. Stir in the remaining butter, goat’s cheese and seasoning, cover and leave to stand while you cook the scallops. Wash the scallops and pat dry with kitchen paper. Remove the corals and cut them and the scallops in half. Heat the remaining oil in a small frying pan and cook the scallops very quickly on both sides for a minute or two until browned and firm to touch. Add the brandy and flame with a taper if using. Let the flames die down then season, add the lemon rind and juice. 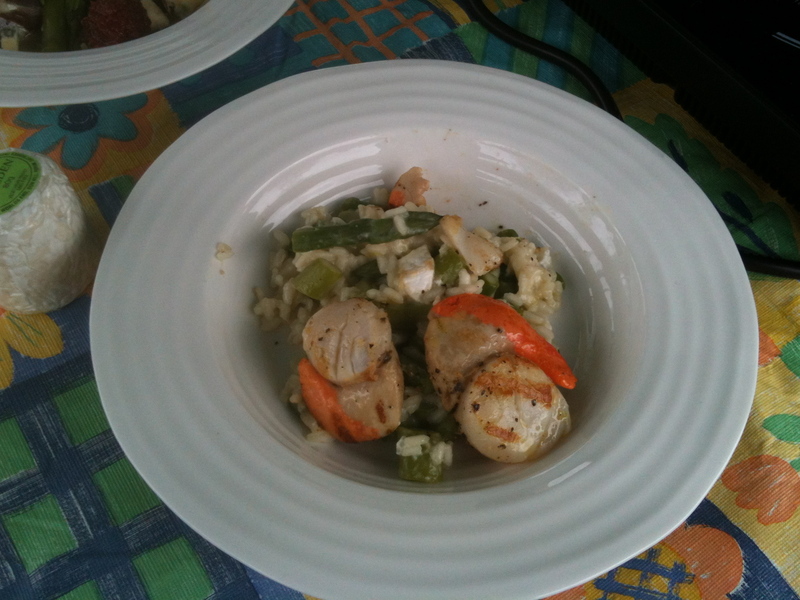 Serve the risotto on warmed serving plates and arrange the scallops on top. (with a really good bottle of white wine – I would choose my favourite white Burgundy). I sometimes use a herb butter to finish the dish. Whiz up in a blender or beat the butter with 2 – 3 tablespoons finely chopped fresh basil, chives and mint before adding to the risotto. This entry was posted in In season, Recipes and tagged Asparagus, farmers markets, in season, local food, Penshurst, recipes, Rye Bay, Scallops. Bookmark the permalink.